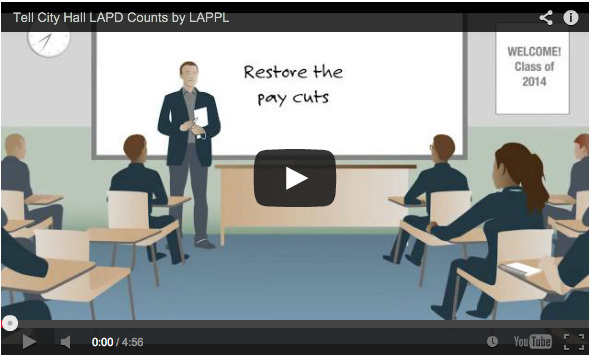 Alarmed at the continued decline of real wages endured by Los Angeles police officers, the Los Angeles Police Protective League (LAPPL) – the union representing all sworn personnel in the LAPD up through the rank of lieutenant – has produced a video to educate the public about fears that the lack of raises and competitive pay will cause high trained, experienced officers to leave for better paying jobs in other agencies. Los Angeles city leaders have promised to make Los Angeles “the safest Big City in America.” We believe in that promise. However, keeping our communities safe means more than merely the total number of officers in the Department. Our officers must have the ability to do their jobs safely and in a timely manner. We have to commit to recruiting the best and the brightest officers, and then do everything possible to KEEP those highly trained, highly skilled officers on the job. The men and women of the LAPD have partnered with the City to help reduce costs and manage budgets. During these lean budget years, officers stepped up and made sacrifices while carrying forward the tradition of proud and professional service. LAPD officers are sworn to protect and serve. It’s a promise they don’t take lightly. Angelenos, will you join us in promising to those who keep our neighborhoods safe that you value their commitment and dedication, and that you will support our leaders in their efforts to put Public Safety First? Please take a moment to watch this short video animation about how the LAPD have made Los Angeles reach its lowest crime rates in decades. After you watch the video, please tell City Hall that it is time to get real about “making public safety in Los Angeles a first priority”. It means paying our officers competitive wages to help recruit and keep skilled officers on the job instead of leaving for other agencies. Tell City Hall that the time to act is now. Actions speak louder than words. Tell City Hall to put our Public Safety First and support the men and women of the LAPD!